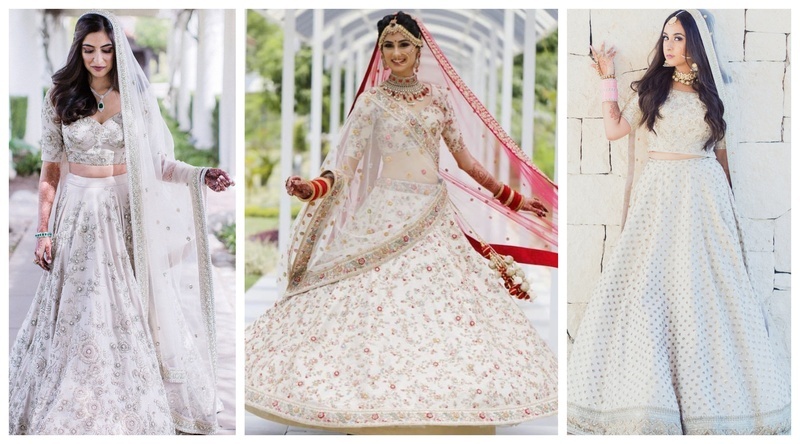 15 brides who wore a White Lehenga to their Indian Wedding and looked like a dream! Not all brides dream of ‘Lal dupatta ud gaya re tera hawa ke jhoke me’ . A lot of brides these days want to ditch their reds & pinks for the dreamy whites and by the looks of it, they are def slaying it. Rubina looked totally dreamy in an ivory lehenga-skirt with a net-overlay paired with a multi-coloured gotta-patti embroidery and a sheer net dupatta. Trisha Khatri the Sabyasachi bride who had a beach wedding at Fiji Islands, wore a heavily embellished lehenga with an ivory base and evenly placed motifs on both the lehenga and choli paired with a sheer dupatta. This bride who had an all-white wedding in Mexico, chose to wear an all-white Sabyasachi lehenga and slayed her wedding day. If you don’t want go for an all-white lehenga as you still want a bit of red in it, then I say take cues from this bride. I am totally loving this bride who chose to wear a lehenga with an ivory base with red and green thread embroidery on it and a sheer white dupatta. To add the hint of colour she added the 2nd red sheer dupatta. Masoom Minawala stole a million hearts when she wore this ivory base Anamika Khanna double dupatta lehenga with floral work on it with pink undertones on it overall. *Look at that twirl* Totally stunned by this bride’s all white lehenga skirt paired with a crop top choli with floral print on it and that jazzy border on the lehenga skirt. How stunning is this lehenga? This bride chose to wear a Sabyasachi lehenga with an Ivory base comprising of a multi colored embroidered choli and the lehenga skirt with an extra border with motifs. I am stunned by the sheer elegance of this bride’s lehenga. She chose to wear an all-white lehenga with lilac undertones and placed motifs to take her wedding vows and looked her most stunning self! Sonam Kapoor made headlines when she chose to wear this stunning ivory & gold chikankari Abu Jani and Sandeep Khosla lehenga for the her sangeet and mehendi night and even after months from it, I still can’t get over how stunning it is! Kreesha Bajaj was hell of a stunner at her wedding when she wore this self designed personalised lehenga. Some of the details included her and her husband’s name in a chevron pattern, her proposal in the Maldives, her wedding location and more. My favourite bit were the dolphins who apparently play an adorable part in their love story since they both met protesting against cetacean captivity. For her Sangeet night Poorna Soni chose to wear this custom made Manish Malhotra lehenga with 3-D threadwork and encrusted crystals on it and looked totally sparkly. Another stunner to the list of brides who killed it in an all-white lehenga with red undertones Anushka Rajan sure looked stunning. Loving her all white lehenga with a net-overlay and red floral work on it overall. In love with how this bride has bought the pop-of-colour to her all-white lehenga with her multi-coloured hem. Stunning isn't it? How cool is this all-white lehenga with the silver work on it? If you too wanna shine bright on your D-day then I say totally go for this jazzy number. What happens when you can’t decide between a lehenga, saree or a gown to wear for your wedding? Apparently Sherry Shroff went and said Gaurav Gupta the same as she was confused, and the ace designer gave her this. Well, it sure was a win-win situation! With all the beautiful white lehenga list coming to an end, I hope by now you know which white lehenga you wanna opt for your D-day!